Not only are bathrooms peaceful and quiet, an upgraded shower will help you sell your home. That is why you want to get your new shower enclosure from a Diamond Certified shower enclosure company in San Francisco. You can make your bathrooms feel more luxurious by installing a new shower enclosure and even remodeling the whole room. Shower enclosures now add a whole new dimension to the look of a bathroom. 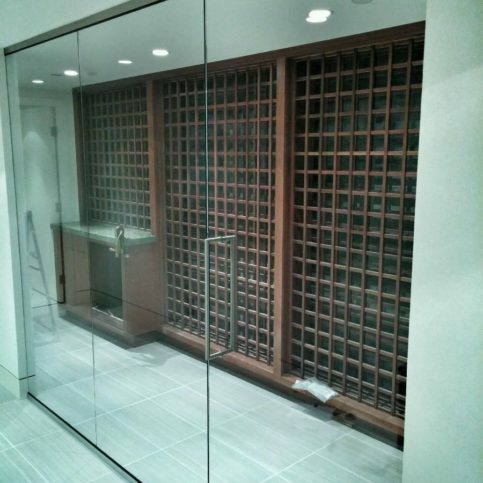 Showers look more airy with all glass enclosures and give the feeling of a spa. There are a variety of options to choose from when you are ready to install a new shower enclosure. You can choose frameless, steam, walk in, or doorless shower enclosures. You can add thousands of dollars of value to your home by installing a new shower enclosure. 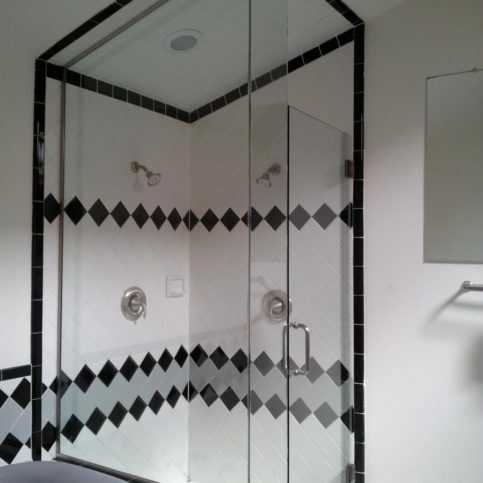 A San Francisco shower enclosure company can help you design your new shower. A good shower enclosure company will make sure that all aspects of your new shower are working and they will check to be sure that there are no leaks and that the shower is sealed well. When you’ve carefully chosen a good contractor, you can relax and enjoy the process as you let your local shower enclosure company lead you through the decision making and process of getting a new shower enclosure. You need to know that you are hiring true professionals who will give you the high-quality results and great customer service that you want and need. But choosing the right one takes research. That is why it is important to carefully choose your shower enclosure company. The research has been done for you. Research is the key to finding and hiring the best shower enclosure company in San Francisco. These shower enclosure company can offer you excellent customer service because they have a vested interest in providing a great work ethic and ensuring that you receive the best service possible. There are many choices to make when deciding on a shower enclosure which is why it is very important to choose a Diamond Certified company in San. Making a wrong choice on the shape or material for your shower enclosure can be a decorative and costly mistake. It is important that you take the time to consider what you need and want before purchasing a shower enclosure. Now is the time to do the preparation work for your shower enclosure. Determine your style and any specifications that need to be met such as a special size or shape. Without doing the preliminary work you may buy a shower enclosure that doesn’t meet your needs, style or specifications. Look at the area where you new shower enclosure will be installed. 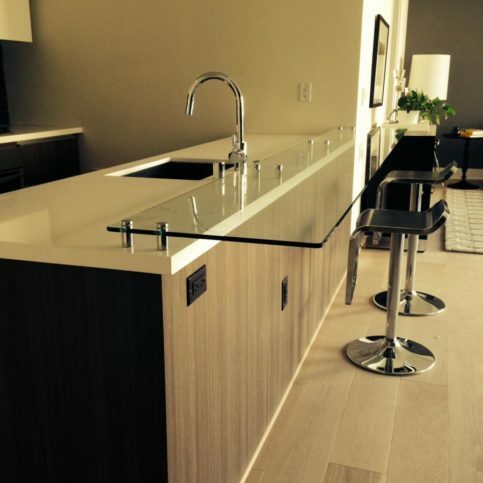 You need to think about the size and shape that will fit in the area as well as the height. When choosing the location and position of your shower enclosure you want to make it accessible. If your shower enclosure is too large, it may overpower the bathroom and a small shower enclosure may not be comfortable to take a shower in, but your space will partially dictate the space restrictions for your shower enclosure. Also consider the position of the shower enclosure. If this is part of a remodeling project try to keep the shower in the same location. It can get very costly if you try to move a shower to a new location. There are many shapes of shower enclosures such as square, round and rectangle, etc. You need to choose a shape that goes with the style of your home as well as be in proportion to the rest of your bathroom. Other considerations may affect which shape you choose for your shower enclosure such as adding a steam shower or adding a tray to a corner shower. Look at magazines and decorating books as well as model homes to get inspiration for your shower enclosure. You may want to keep samples, pictures and swatches to share with your shower enclosure company to help them know your style and what you are looking for. Not all San Francisco shower enclosure companies are the same. They have varied degrees of experience and philosophies. It is your right to choose a qualified and reliable shower enclosure company in San Francisco. They will install your shower enclosure and they will get it right the first time. A Diamond Certified shower enclosure company can help you choose the right shower enclosure for you. They will aid you in finding the shower enclosure that fits your requirements and after installation they will ensure that it is in perfect working order. Many home owners are disappointed with their shower enclosures because of corrosion or peeling and aging of their shower enclosures. By hiring a Diamond Certified company, you will bypass these problems and be happy with your new shower enclosure. A Diamond Certified company will use good shower enclosure brands that have been tested and proved. All Diamond Certified companies have already been thoroughly researched for you, including license verification. However, if you’re unable to choose a local Diamond Certified shower enclosure company, you’ll have to do the research yourself. Why Trust Diamond Certified Shower Enclosure Companies Rated Highest in Quality? Tom Nolan is a veteran of the shower enclosure industry and president/CEO of California Shower Door Corporation, a Diamond Certified company since 2005. He can be reached at (415) 763-5983 or by email. A: “The Alchemist” by Paulo Coelho. A: Music. I went through a talk radio phase, but as I’ve gotten older and hopefully a bit wiser, I’ve grown tired of all the banter. A: Playing the guitar. I played in a band from age 14 until I was about 21. Q: Who’s your all-time favorite guitar player? A: Clarinet, because I love traditional New Orleans jazz. 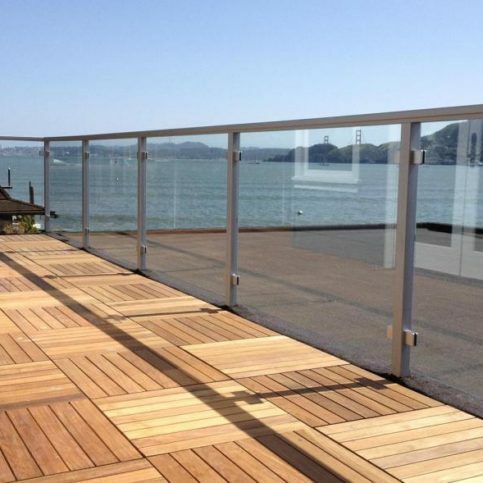 California Shower Door Corporation recently completed this patio rail project. 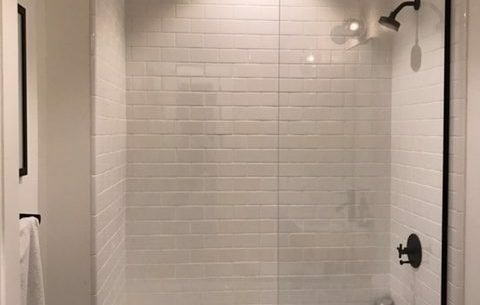 Many factors should be considered before selecting a shower enclosure company in San Francisco that will meet your needs the most successfully. Write down everything that you’re searching for before you begin your research. Consider the following questions before making your final selection of a shower enclosure company. What is my budget for a new shower enclosure installation? What type of shower enclosure am I most interested in for my shower project and does it match the style of my home? The next step is to interview San Francisco shower enclosure companies in person. This will give you a chance to meet and evaluate the companies in person, as well as give them a chance to see your job and offer you a more accurate bid based on your specifications. How many shower enclosures has your company installed in San Francisco? Does your shower enclosure company carry workers’ compensation and liability insurance for your shower enclosure crew? What types of warranties and guarantees are available on your shower enclosures? What is covered with any offered warranties? How does your shower enclosure company price new shower enclosure installation? Does your shower enclosure company have a current business license to sell shower enclosures? Can you give me a list of references that I may contact? How long should it take for your shower enclosure contractor to complete the installation of my shower enclosure? It’s best to choose a Diamond Certified shower enclosure company because all certified companies have passed an in-depth ratings process that most other companies can’t pass. If you want quality from a shower enclosure company in San Francisco and the greater Bay Area, you can have confidence choosing a Diamond Certified company. Diamond Certified reports are available online for all certified companies. And you’ll never be fooled by fake reviews. That’s because all research is performed in live telephone interviews of actual customers. 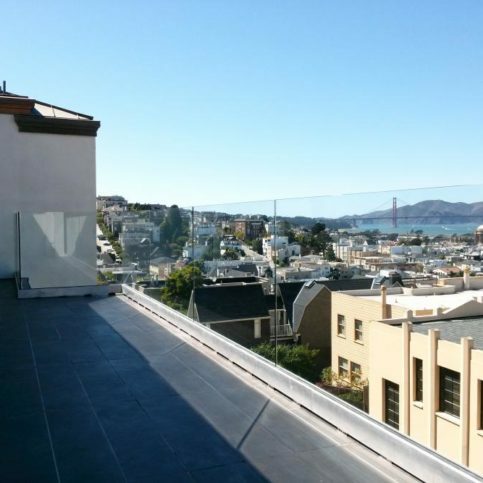 Were you satisfied with the service from your San Francisco shower enclosure company? If you need a new shower enclosure in the future, will you consider going back to this shower enclosure company again? Did the shower enclosure company finish the job on time? Did they clean up after completing the job? Did they show up on time? Were there any unexpected costs for your shower enclosure? If so, what? What type of shower enclosure did you purchase from this shower enclosure company? Would you recommend this shower enclosure company to your family and friends? Did the shower enclosure company keep you up to date on the status of your project? 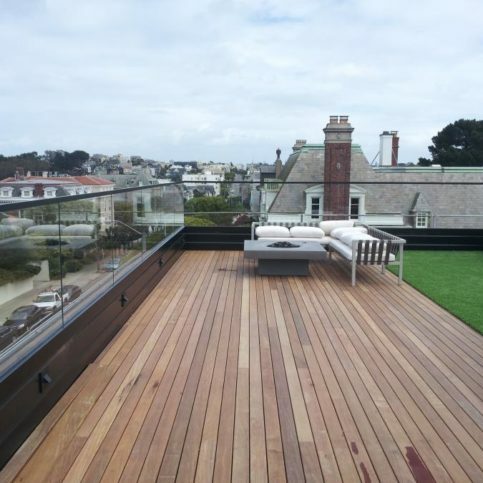 If you live in a smaller area such as Barbary Coast, The Castro, Cole Valley and Cow Hollow, did you have to pay extra for their travel expenses to your home? Did you feel like the shower enclosure company charged a fair price for the quality of the work? Did the shower enclosure representative seem receptive to your input? Did the shower enclosure company provide answers to your questions to your satisfaction? Before deciding on the best shower enclosure company in San Francisco for you, it’s important to consider the following questions. What is my time frame for this shower enclosure project: when do I need to have it accomplished? Which shower enclosure company has payment options that work the best with my budget and space? Is my shower enclosure company of choice well-established in the community with a good reputation? Does my shower enclosure company of choice have good references that I have checked? Is my shower enclosure company of choice charging a reasonable price for quality shower enclosures and service? Which shower enclosure companies in San Francisco offer the better warranty for the price? After you have found a San Francisco shower enclosure company that you can trust, you will have peace of mind as you begin the process of planning for your shower enclosure project. Once you’ve hired a shower enclosure company, you will have an initial meeting between you and the company’s representative to discuss your requirements and the shower enclosure company’s qualifications. An estimate of the project is drawn out. You will also discuss the budget and design of the shower enclosure project as well as any restrictions and permissions that will be needed. Use the notes that you have taken so you can accurately describe any concerns that you have. Be very detailed and don’t be in a rush. It is as important for you to hear their suggestions and observations as it is for them to hear you. If you don’t understand something, ask for an explanation. It is important for you to completely comprehend the shower enclosure project and what it entails. The shower enclosure company will provide you with an estimate based on the specifications. They will also offer choices. Once the final contract has been drawn, the next step will be applying for permits if they are needed. Last of all, the shower enclosure project and financing process will begin. Be sure to get all estimates in writing before any work begins. The estimate should include an itemized list of the cost of supplies and the labor. Don’t ever sign a blank estimate. When you feel satisfied with the information you have received from your San Francisco shower enclosure company, you are ready to sign the contract. Be sure that they have a phone number where you can be reached at all times. Once the contract is drawn up, it should be signed by both parties: you and the shower enclosure company’s representative. If any sub-contractors will be involved, they should sign the contract as well. The contract should protect the interests of both you and the shower enclosure company. Expect the shower enclosure company to stay within the estimate. However, if the actual cost exceeds the original amount of the estimate, they must get your approval before moving ahead. The estimate or quote of the project. A payment schedule as well as the terms for the contractor, subcontractor(s) and suppliers. How “change orders” will be handled. Any changes or additions to the project should be written up in the contract so that the conditions for change are pre-determined. Furthermore, the contract should list how and when payment will be made for adjustments. Professional shower enclosure companies are able to handle the very small to very large aspects of their work. However, there are some things that you can do to prepare for them and to make their progress in your shower enclosure work go more smoothly. Doing these things may even cut down on their labor costs and can keep your home and belongings from being damaged. Remove any furniture or movable items from the area. Before they begin work on your shower enclosure job, remove all of the objects that may be in the way. Keep your pets and children away from the area. Your shower enclosure company will be focused on your project and should not have to watch out for your pets or children at any time. This not only prevents accidents and injury but also any expense that comes from accidents that may happen because of children and pets being in the way. Provide parking space and room for their work vehicles to maneuver. Shower enclosure companies may have large vehicles that require more space than average. Contact your shower enclosure company before they begin building and ask them how many parking spaces they need and how much room they need for oversized vehicles. It is also helpful to walk through the area with your shower enclosure company’s representative so any hazards or clearance issues can be pointed out before the actual work begins. It’s the shower enclosure company’s responsibility put in quality shower enclosures using the best possible installation techniques. But you play a big part in the success of your shower enclosure project, too. 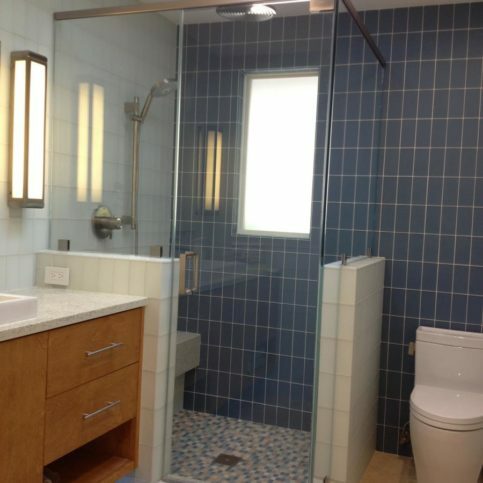 Here are a few simple steps you can take to be a good customer when hiring a San Francisco shower enclosure company. 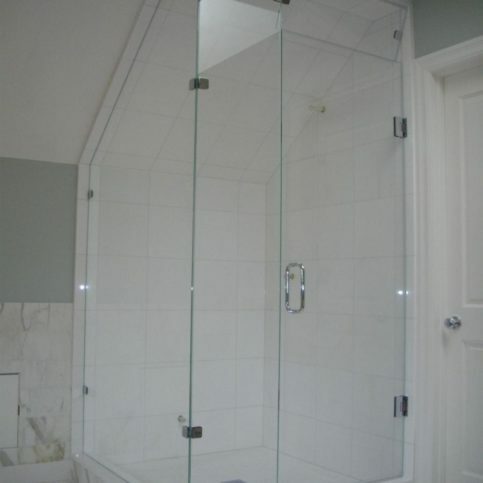 Be clear and upfront with the shower enclosure company. Let them know what you want from your shower enclosure project, the long-term outcome you’re expecting and specific ways they can satisfy your expectations. Pay for the shower enclosure work promptly. When your contractor contacts you, return calls promptly to keep the shower enclosure company on schedule. 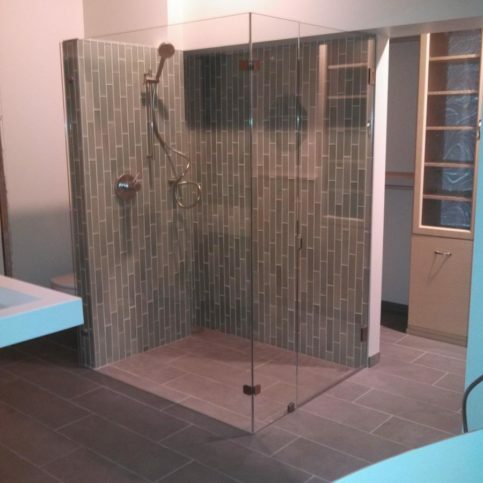 Before you hire a shower enclosure company in San Francisco, restate your expectations and goals, and reiterate to the shower enclosure company’s representative your understanding of the agreement. Most problems with local shower enclosure companies occur because of a breakdown in communication. By being clear about your expectations and theirs, you can avoid most conflicts. Ask your shower enclosure company if you should call to check on the progress or if he will call you with updates. Be sure your service representative has a phone number where they can reach you at all times while they’re installing your shower enclosure. The work will move along more smoothly if your shower enclosure company can reach you for any necessary updates, questions or work authorizations. Why would you want to be a good customer? 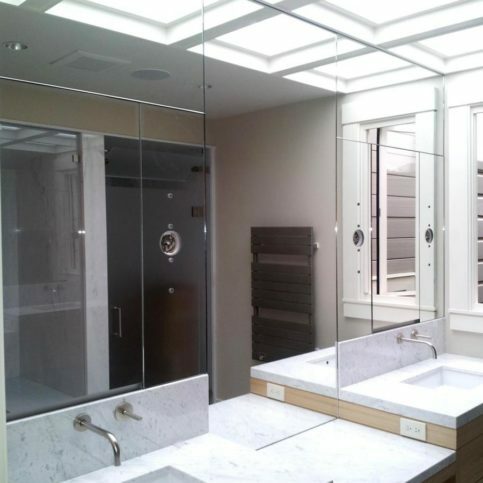 Shower enclosure companies in San Francisco appreciate customers who are straightforward, honest and easy to work with. Your good customer behavior sets the tone from your end and creates an environment conducive to a good relationship. Things may very well go smoother and any problems may be more easily resolved. When the shower enclosure is safely installed and the work is completed, your shower enclosure contractor is required to give you a written invoice. Most good shower enclosure companies will offer some type of warranty on the shower enclosure work. Before the shower enclosure contractor leaves, confirm any warranties offered by the shower enclosure company in San Francisco. What the warranty covers. This should include whether the shower enclosure company will replace or repair faulty shower enclosures or give you a refund. Any exclusions must be explicitly stated. Your responsibility in the case of a shower enclosure problem and what you need to do in order to redeem the warranty. If the tile warranty coverage is transferrable to the new owner in the event that you sell the home or building in which the shower enclosure has been installed. Steam shower enclosures are showers that are built to accumulate steam and heat. Round shower enclosures are shower enclosures that are round adding an architectural element to the shower. Doorless shower enclosures are showers without doors. These are showers that you “walk in” but the showers are partially enclosed. Frameless shower enclosures are usually glass enclosures that are not blocked by any frame. Tiled shower enclosures are tiled around. This is usually the most common and economical choice for showers. Glass shower enclosures are shower enclosures that are made of glass. Ceramic tile shower enclosures are shower enclosures that have ceramic tile. Ceramic tile gives you many choices for decorative accents and designs. Glass block shower enclosures are contemporary and clean looking shower enclosures. They provide the look of glass but increase privacy by obscuring the interior of the shower. Neo-angle shower enclosures are diamond shaped (neo angled) and have 3 glass sides and 2 walls. These are used for save space by using the corner for a shower. Corner shower enclosures are shower enclosures put in the corner of a room. These are usually used to save space. The following list includes popular shower enclosure brands used by many local shower installers. 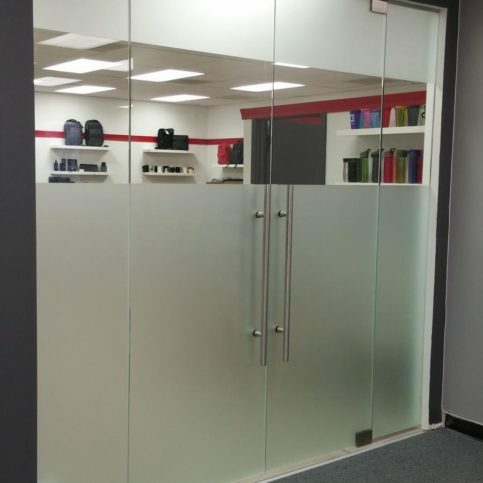 Annealed glass is very brittle and can be used for windows and other objects; however, it is not used for shower enclosures for safety measures. Buttresses separate bathtubs and showers. Oftentimes, shower seats are installed between on buttress walls. Clear glass is glass that is transparent or see-through. Clear glass is sometimes used for shower doors. 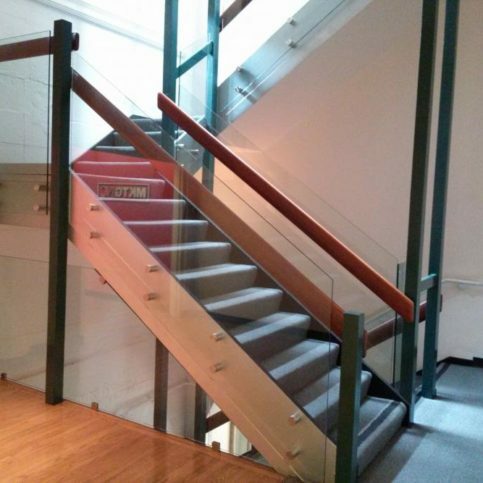 Flat polish is glass that has a large flat glass surface that has been ground to a flat polish. This is sometimes used on glass shower door enclosures. Glass clips are used in shower enclosures to secure the panels to the base of the shower. Shower glass clips come in a variety of colors, metals, sizes and shapes. Hinge plates area plate made of metal that are attached to the hinges of shower doors. Inline panel is glass that is tempered and runs straight or in a line with the shower door. 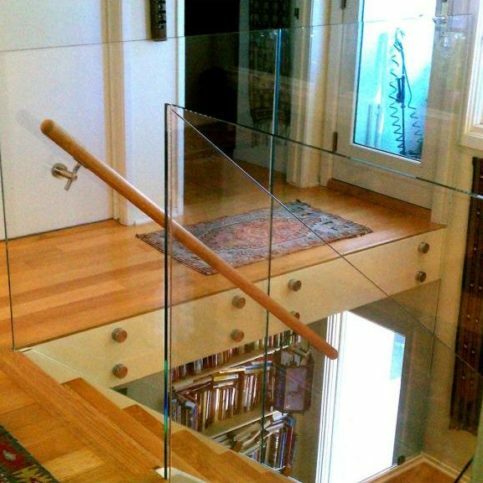 Laminated glass is made by putting layers of glass together to make the glass stronger. Laminated glass is a popular choice for shower doors because of its strength and safety properties. Mildew resistant silicone is added to keep mold from growing in shower enclosures. Mitered corners are corners that have been mitered to a 45 degree cut on a return panel. These are popular design featuers in some shower enclosures. Neo angle shower has two or more hower glass panels with a door. Two of the panels must have a 135 degree angle. Most of the time there are three shower glass panels included in a neo-angle shower. Obscure glass is glass that is semi-transparent and lets some light through. 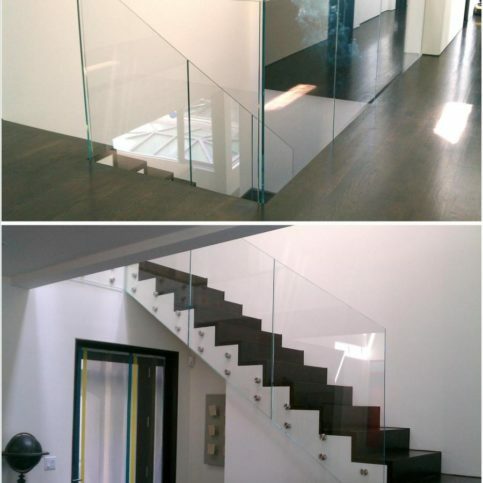 Patterned glass is glass that has shapes molded in it for decorative purposes. Pivot doors are shower doors that rotate or pivot rather than swing. Pony wall is a shorter wall that most of the time is around 36 inches high and can also be used to separate tubs from showers. 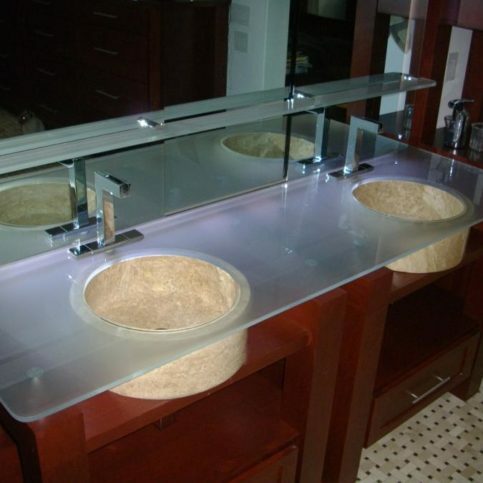 Reflective glass is glass that reflects back some of the light that hits it. Return panel is on the backside of a shower and can be used to separate the tub from the shower. It is tempered. Right angle shower is an enclosure that has a door with an inline and return panel. Shower dam holds the water in the shower stall and keeps it from running out. shower header Shower headers are installed on top of shower panels and are usually made of metal. Silk-screened glass is glass that has been silk-screened with decorative images to make it appear that it has been etched or textured. Sliding panels are panels that move in a bypass door. Steam baths are shower enclosures that have specialized plumbing systems that create steam. Tempered bugs are stamps on glass that show it has been tempered. The stamp is etched or may be sand blasted on. Tempered glass is an important feature in shower enclosures. Tempered glass is about 5 times stronger than annealed glass. It is used for safety in shower doors. Textured glass is glass that is texturized on the surface to create a translucent look. Tinted glass is glass that has a tint of color in it. U channel is a channel that is used in the installation of shower enclosures and is in the shape of a U.
Q: Why choose a Diamond Certified shower enclosure company? A: Diamond Certified helps you choose a shower enclosure company with confidence by offering a list of top-rated local companies who have passed the country’s most in-depth rating process. Only shower enclosure companies rated Highest in Quality earn the prestigious Diamond Certified award. Most companies can’t pass the ratings. American Ratings Corporation also monitors every Diamond Certified company with ongoing research and ratings. And your purchase is backed by the Diamond Certified Performance Guarantee. So you’ll feel confident choosing a Diamond Certified shower enclosure company. Q: Are frameless enclosures better than framed? A: Many do find frameless enclosures more attractive than framed. Also, a frameless enclosure can raise the value of your home. For beautifully tiled shower walls, you may want to choose a frameless enclosure as it will show off the beautiful tile or marble. Q: What can I do about hard water stains on my shower glass? A: Ask your shower enclosure company what they recommend for cleaning your glass shower enclosure. Shower enclosure companies carry shower cleaner and protectors that will repel water and help keep the glass shower enclosure clean and stain free. Q: How do they make shower enclosures look like painted glass? 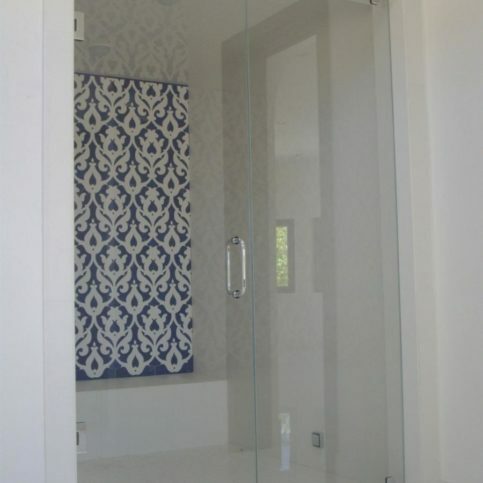 A: The painted glass you are seeing is actually silkscreened and melted onto the shower enclosure. It is made of crushed glass and a dye. Because it is melted onto the glass it doesn’t chip off. Q: Does clear glass need to be cleaned more often than obscure glass? A: Clear glass may show dirt faster but it doesn’t get dirty faster than other glass. By consistently wiping down your shower every time you use it, you will keep it looking new for years. Ask your shower enclosure company what they recommend for cleaning as there are some special glass cleaners which will help your shower enclosure stay beautiful. Q: Should I use tempered glass for my shower enclosure? A: The only way to have a safe glass shower is to use tempered glass. Tempered glass is much stronger than regular glass. It is heated and then cooled so that if it breaks it breaks into very small pieces. This reduces the chance of hurting anyone or causing extreme damage. Q: Is it normal for the glass in glass shower enclosures to have imperfections? A: Yes, imperfections can happen in the tempering process. As the glass is heated and cooled, it may get dust or other material on it which may leave a print. Q: Can frameless shower enclosures leak? A: If your frameless shower enclosure is installed by a professional shower enclosure company, it should not leak. Good frameless shower enclosures are reliable and operate without leaks even if they are put under rigorous use. Q: Are there advantages to getting a frameless shower enclosure versus a framed? A: There are several advantages to a frameless shower enclosure. A frameless door can open either in or out – a framed door will only open outward. Because you are eliminating metal, the shower will feel more open and you will also avoid rust developing on metal. A frameless door actually will last longer also.